Rent A Desk is a co-working space that has four branches in the city, and it's ideal for freelancers and small business groups seeking a budget-friendly but cool office space. 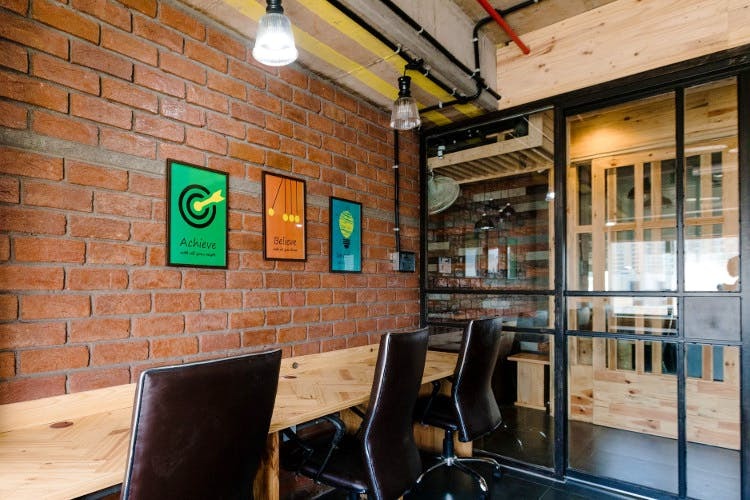 Started by local businessmen — Anees Jafri, and Kazim Hameed in 2014, Rent A Desk now has four coworking spaces spread across the city (with Hitech City branch being the newest addition). We checked out their Jubilee Hills space and were in awe of the swanky wooden setting, and exposed brick walls that give it a distressed yet cosy ambience. The conference room is well equipped with a screen and adorned with quirky posters. They provide facilities like high-speed internet, lockers, complimentary coffee and printers starting at wallet friendly prices of INR 350 per desk, per hour. You can also rent out cabin spaces and the meeting lounges if you're bored of working from home and coffee shops. This gives you an opportunity to network with people from diverse backgrounds, and access to all your office needs (You do have to get your own laptop, however!) without having to shell out large amounts. So, whether you are a freelancer, a small business company or just about anyone who needs something better than home, but not as boring as an office — you most certainly must rent a desk here.